Despite the fact that there's a Kre-O Bruticus box set, it only contains four Combaticons. You can find a fifth, however, in the first series of blind-bagged Micro-Changers. Ooooooh, lucky me! I get to tell you pathetic humans all about myself. Well, listen up, blockheads! I don't care what you think of me! I'm built better than any other Kreon out there, and I know it. I'm perfectly happy hanging out in deep space, all by myself. All alone. Favorite sound: The silence of space, where I spend all my time so very, very alone. Hobby: Blasting targets to dust from orbit. Favorite snack: Liquid oxygen. It's the fuel that keeps me going! Awww, isn't that sad? And adorable? "Sadorable." And it's all a direct homage to Blasty's Generation 1 personality, just making everything everything softer and cuddlier. The figure is grey (even though the original toy was brown) with a purple chest, black head and has wings on his legs. His visor is gray, and he uses the same rounded, sloping helmet as Mirage, despite his head previously being a cube. The black, yellow and blue details on his chest match the decals the G1 toy wore, and he gets a large, complex gun. In fact, there's only one brick in the set that isn't used for this mode. As you may have been able to guess from the wings and nosecone and name, Blast Off turns into a space shuttle. All the Combaticons were World War II-era fighting vehicles, and then there's a space shuttle. Authentic! The altmode is basically just the robot laying face-down, but it works. It's particularly clever the way they used the gun parts to create the tail fin of the shuttle, and included some trans yellow discs to serve as exhaust. If this were the only Combaticon available, I probably wouldn't have gotten him - and it's annoying that he doesn't get to be part of Bruticus. But you can build him into the set if you want, and the team looks great when they're standing together complete. 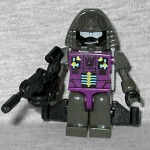 This entry was posted in addendums, blog exclusive review, Hasbro and tagged Kre-O, Transformers. Bookmark the permalink.